Kids today need to know that they are not alone. They need to know that the things they are struggling with and yearning for have been felt by people throughout the ages and that the one constant was, is and will always be God. As God was faithful in the past, so will he also be faithful to us now. Whether they are dealing with disappointment...a death in the family...a school yard bully... or some other difficult situation, it’s important for kids to understand that they can ALWAYS turn to God to help weather life’s storms. The Psalms give children comfort that God is faithful, and will always be there for them. The Psalms teach children how to approach God, how to talk to Him, and how to ask for help. The Psalms give children the words to help express how they are feeling. Above all- the Psalms help children learn to turn to & trust God. In this powerful resource, you'll give kids a solid "big picture" understanding of the Book os Psalms as it relates to the Bible as a whole. However, we do not believe in overloading children by introducing them to all 150 Psalms. Instead, we take a quality over quantity approach, and have selected 9 Psalms we feel truly resonate with kids ages 4-12. Kids will discover how words of faith, praise, and encouragement can draw them closer to God and how when they are in a tough situation their first step should be to turn to God. Psalm 23:4- Yea, thou I walk through the valley of the shadow of death, I will fear no evil. Psalm 121:1- I lift up my eyes to the hills; my help comes from the LORD. Psalm 37:1-2- Do not be envious of evildoers, for they will fade like the grass. Psalms 37:4- Take delight in the LORD and he will give you the desires of your heart. Psalm 27:10- For my father and my mother have forsaken me, But the LORD will take me up. Psalm 32:8 I will instruct you and teach you in the way you should go; I will counsel you with my loving eye upon you. Psalm 25:9- He guides the humble in what is right and teaches them his way. Overview: What Exactly ARE the Psalms? Kids learn why Psalms written thousands of years ago are still highly relevant to life today! Knowing that God is faithful and His promises true are often just what a child needs to hear to get through a bad time! These Psalms teach kids what they can expect from God, what upsets him and how fantastic He really is! Each lesson is accompanied by a game and craft that serve as reinforcement activities. In short, you get everything you need to teach kids about the most celebrated Psalms. What we can always expect after times of trouble – and why this should infuse us all with great hope! Order Now & Receive the Following 3 Bonus Gifts! Use our printable 8.5 X 11 certificate to award students upon completion of the Psalms for Kids Lessons. 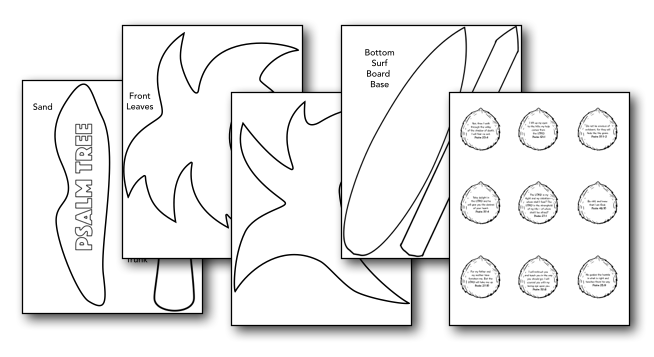 Ready to take your standard coloring sheets up a notch? 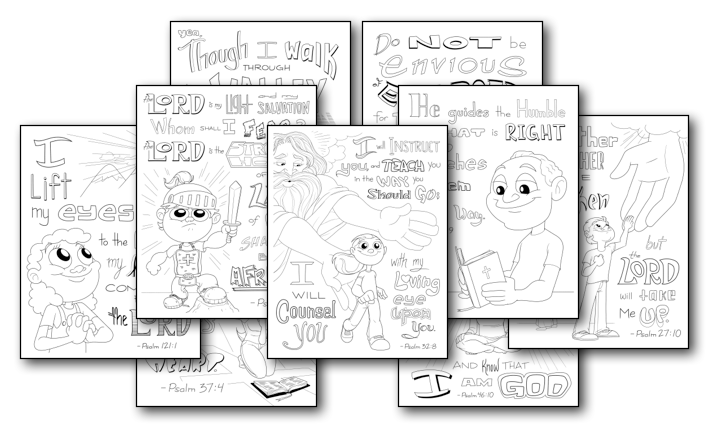 Our 9 Printable "Psalm Doodles" Coloring Sheets print out like standard coloring pages. Each one contains a Psalm and a picture to help the verse "stick" in children's minds. This is a terrific activity to keep the kids busy before or after class! It looks like a palm tree- but it's better! It's a Psalm Tree! 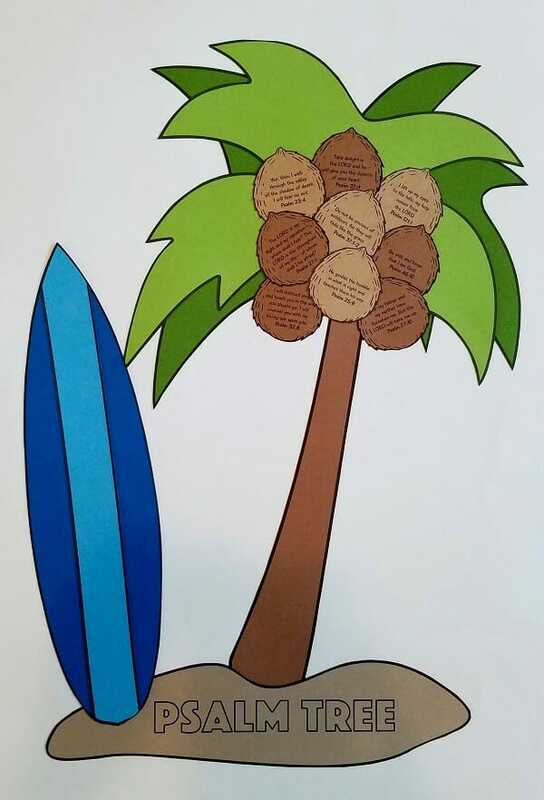 Using our printable templates, kids can assemble their very own fridge-worthy Psalm Tree to take home. Each tree is bearing the fruit of the Psalms! You can print out the templates on construction paper (as we did in our example) OR you can print out on standard white paper and the kids can color in each element- either method is adorable and fun! 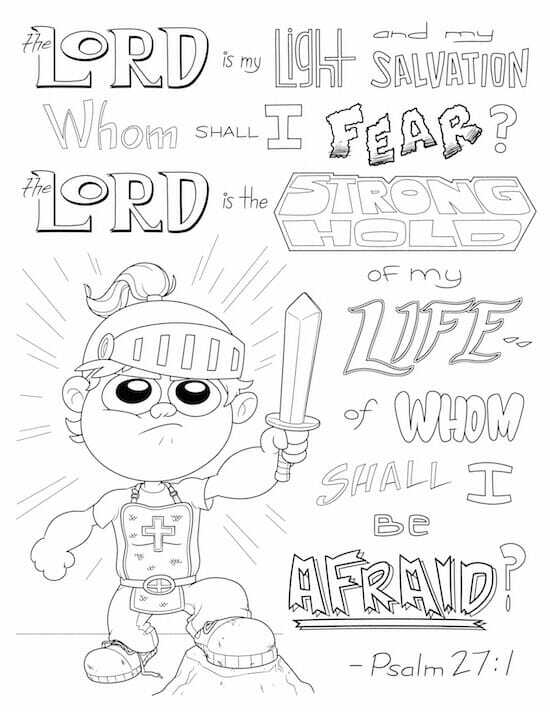 "Psalm Doodle" Coloring Sheets as You Need! 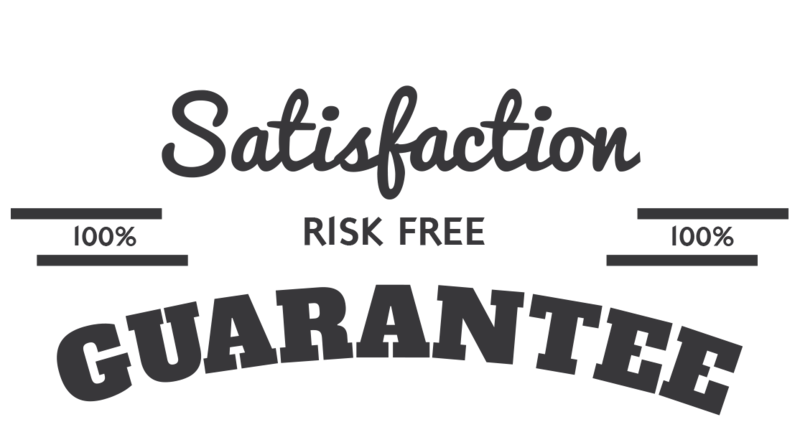 That’s right, we are so sure that you will love the Psalms for Kids Lesson Pack that we are offering an unconditional 100% money-back guarantee. Help Children Get to Know God Better AND Learn to Interact With Him in the Best Way! The Psalms are great for showing us what our relationship with God should look like. They give us guidance on how to approach Him and direction on how to speak to him from the heart. From these powerful verses, we learn how to cry out to him in times of need and how to gain strength from his love and faithfulness. The Psalms are essentially building blocks that can help young Christians build their faith and learn to trust God more. YES, I want in! 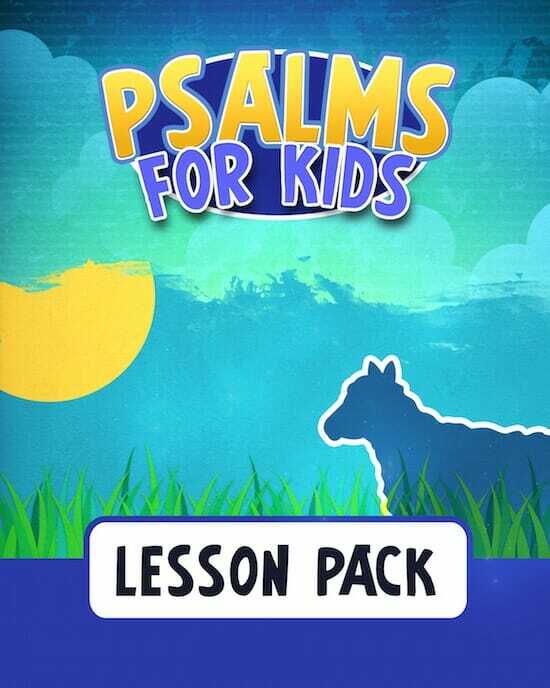 I want access to the "Psalms for Kids Lesson Pack". Please give me INSTANT access right now! Our lessons can be used by churches of all denominations. We should note that we used a mixture of NIV, KJV, and ERV Bible translations for the Psalms Lesson Pack. We selected whichever version was the most conducive to helping kids remember & understand the Psalm.